Sally from the MisAdventures of Karl & Sally has started a new Meme, called Remember Wednesday. The idea behind this is to post an old photo, and write your memories of it. I have lots of old photos, so I am in! This is a photo of me in 1962 or 1963. I was 10 or 11 years old. Notice the tightly curled hair. 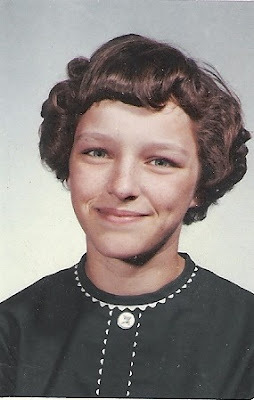 Every school year I could remember, my mother sat me down the night before picture day, and rolled my hair with rags. Yes. Rags. She would tear strips of cloth, tie them around sections of my wet hair, roll them up, then tie again. I looked really silly with them all tied on my head. And being the only girl (well, I did have a sister, but she was 8 years younger than me) with four brothers, I had to survive a LOT of teasing. Those rags with their knots were hard to sleep on. The torture continued in the morning, when Mama took all the rags out and brushed out my hair into the “DO” you see above. She sprayed it liberally with White Rain aerosol hairspray until I thought my lungs would bust, then sent me off to school. There was a lot of giggling and finger pointing going on from my classmates, because picture day was the only day I came to school with my hair “fixed”. To see more of Remember Wednesday posts, click here. I guess I should consider myself lucky. My mother never tortured me like this! Great picture and story. Thanks for playing along in Remember Whensday. My mother was into the stinky permanents. Oh how I hated those. I wrapped a friend's long hair in rags for her wedding and it was beautiful. So glad you decided to join this meme. Should be fun to dig out some of the golden oldies. Or should I say Black and Whites. Oh boy, do I remember rags! But mine were for long curls. I really hated them! But probably not as much as home permanents! And my mother wasn't very gentle putting them in or taking them out. Ouch! Old pics are sure fun to look back on and jog memories. It seems like the cloth curlers would be more comfortable to sleep in and did an amazing job of curling. Hi Karen…I remember my Friend's Mother used to do this for her reguarly…along with perms…invariably the curls only lasted for the day. Thanks for reminding me of this…I had forgotten all about it!!! My mom would never let me grow myhair long enough for rags, maybe I should consider nyself lucky! But what a cute photo. You were (and are) a real cutie – and I love the clear intelligence I can see in those eyes. I love the photo and the "do" well done on surviving this ordeal. I see you have short hair incase anyone should try to wrap your tresses in rags every again! Thanks for a lovely rememberance. When I return from leave with my dh, I will join this meme.